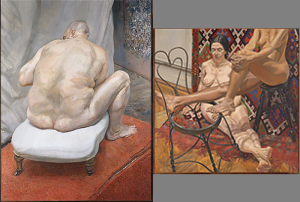 Conveying extreme views of Human Skin, two large paintings are currently juxtaposed at the MET (metmuseum.org) in the gallery for Modern and Contemporary art : Lucian Freud’s Naked Man, Back View (1991) and Philip Pearlstein’s Two Models with Bent Wire Chair and Kilim Rug (1984). Freud’s skin looks sensuous, even hyperreal with its imperfections, while Pearlstein’s skin looks hard like porcelain. Did the MET juxtapose these paintings on purpose or did it happen serendipitously? Photos are only available at a too low resolutions to appreciate these two oil paintings. Visit the MET to grasp the different views of human skin.